Alkysch – I Bless you…. Alkysch is a word in our Siberian language and means Sacred Blessings coming from the Heart. Before taking my finished Medicine Pieces to Markets and shows to sell, I invocate and bless them. Powers of Growth, of teaching and learning! Powers Prayers , of introspection and healing! I wish to call LIFE into these pieces made by me from Gifts from You! For these tools created in the old Sacred Way! Spruce Grouse! I thank you for gifting me your mortal body as material for teaching tools! Heron! I am thankful that you trusted me with your remains. Raven! I am sorry, Amarook, the Wolf ate you, and hope you will be smarter, when next you re-emerge from an egg in a Raven’s nest. Death is just a journey through the dark side of the Endless Circle and like all of us, you will be back. For now, I will honor your feathers and use them well. Hawk! I just found you. You were old and arthritic. You had a good long life. Now you have a little rest and I thank you for your body and your beautiful feathers. Pheasant! Thank you for these feathers. May they be honored and admired as a part of these Medicine Tools and remind people about taking pride in their own heritage. Blue Jay!I thank you for these feathers. May you live a long life and enjoy all the Sunflower seeds we put out for you. Turkey. I am sorry, you ran across the road at the wrong time. I thank you for your feathers. 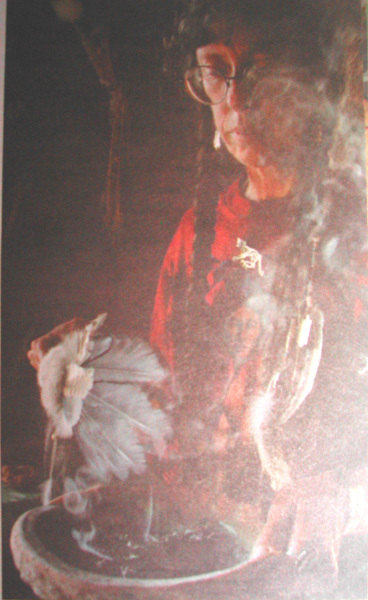 They remind us of your Medicine, to give thanks to Mother Earth for all she provides for all of us. 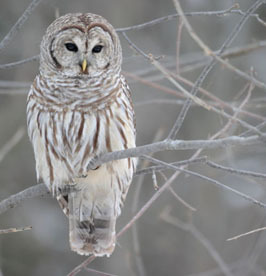 Great Gray Owl! May you have food always and live a long healthy life! May your descendants be many! Woodpecker – I still miss you every day.May you rest in peace and be re-born in spring. Parrot – Philip! May you have food always and live a long healthy life! May you bring joy to your human family! Deer family, I thank you for the gift of hide and hair. With the pieces of your body used here a part of you will live forever and remind the people of your gentle and none violent ways always. Moose family: I thank you for the gift of bone and hide. With the pieces of your body used here a part of you will live forever and remind the people of your Medicine of balance between gentleness and strength always. Fox family: I am so sorry, you, my little brother never got to play in the wild and were born raised and killed for your fur. Now you are free and this piece of your fur brings honor to your kind. Nay you sense the wind, the sun and the rain. Pine Tree, I thank you for the gift of wood that became part of the handle of these pieces. May your family always have wind and water. May your family grow tall and plentiful. I am thankful to everyone and every Being that worked on creating the beads I used here.Their labor is respected and reflected in these pieces. 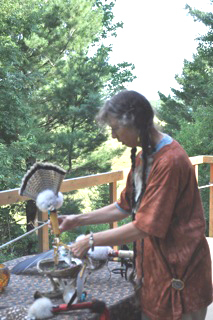 I wish to give thanks to the Mineral family for the materials provided for beads and dyes. I wish to honor everyone and everything that has found a place within these pieces. In the Sacred Smoke of Cedar and Juniper I bless these pieces and call them to Life! In Beauty and humility they are released into the Great Circle of Life. May they find an owner who cherishes and uses them in the most respectful way and with the best intentions only. May you all soar in your living Beinghood. May you go out and be representatives and teachers of the old sacred ways. May your owners be your partners in walking in Beauty and Balance. July is always a very hectic month for us. The Markets and craft shows are busy with eager customers looking for our handmade jewelry, and many of my patients and clients are “up at the cottage” for the holidays and want to see me , discuss problems or learn a little more about the Medicine ways. For the last few days it was a mad rush at our house, to get “everything ready for the Muskoka Arts and Crafts annual Summer Show, that will take place from Friday to Sunday in Anny Williams Park here in Bracebridge. 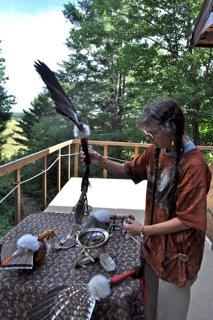 Apart from numerous bracelets, pendants and earrings I also managed to work on 3 large smudging fans. One is a large Heron wing fan, the other 2 are Ruffed Grouse, a wing feather fan and a tail feather fan. This wing comes from a beautiful Heron who met a tragic end on Hwy 11; flying into an oncoming truck. 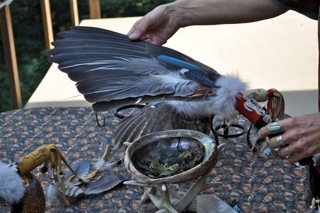 I carefully and lovingly took the wings and feathers, preserved them in order to give this majestic bird a new life and transform its wing into a ritual tool infused with love and respect. For Celtic People Liilh the Heron laid the first ever egg = the egg of creation. She is the guardian of life and incarnation as well as for secret knowledge of longevity. A so called “Crane bag – a druidic medicine pouch was made of the feathered skin of a Heron or a Crane. There she was! In the middle of the road. and there was NOTHING I could do. but left behind were her beautiful tail feathers and one perfectly intact wing. I decided, to preserve these pieces and bring honor and meaning to her life and her species. For Month I hmmmed and haaawed as to how best to mount the wing – then there was this bit of Fox fur and the idea was born…. Since this is the tail of the same Bird, I dressed it with much the same attributes and accompanying feathers. It however has a different Hawk design for a Center piece. I had to laugh out loud! 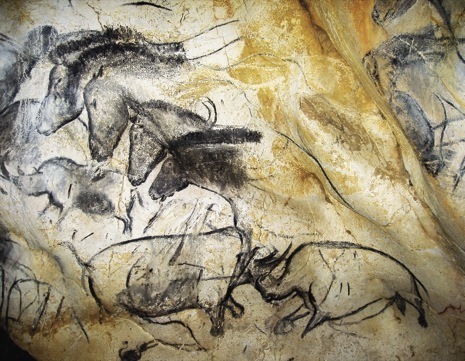 See, yesterday evening we went to see the movie “Cave of forgotten Dreams” from Werner Herzog about the Chauvet Cave in France. 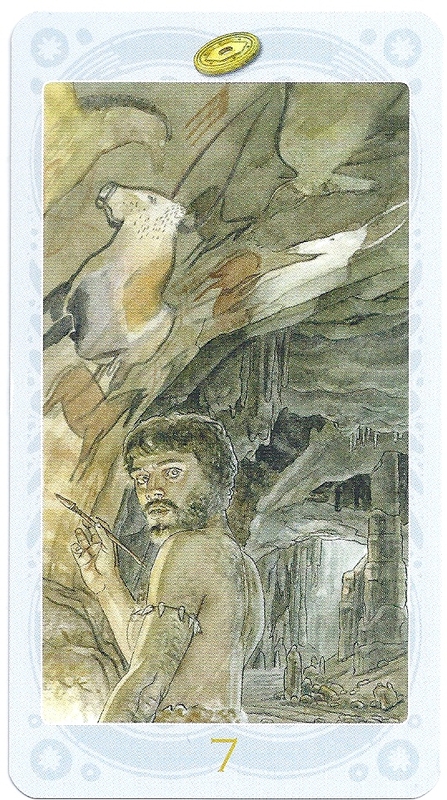 Now today, the 7 of Coins shows a prehistoric person painting on the wall of an ancient cave – supposedly Lascaux, but the Horse drawings above him on the wall look very much like the ones in Chauvet! Yesterday we found it enigmatic and beautiful to see the amateurish film from/ about the elderly scientists exploring the cave, but we also wondered about all the strange avant guard and quite ‘squeaky”violin and cello music, that they used for the film and that none of them had any inkling about the shamanistic worldview of the people that painted these images. 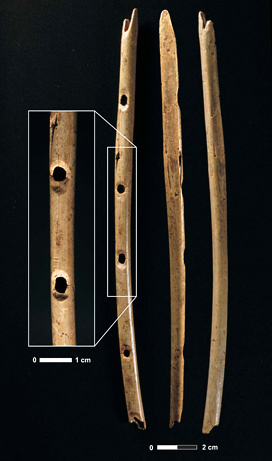 There also was a Reindeer fur clad guy, who plaid on a replica of the oldest Flute ever discovered. And what did he play? 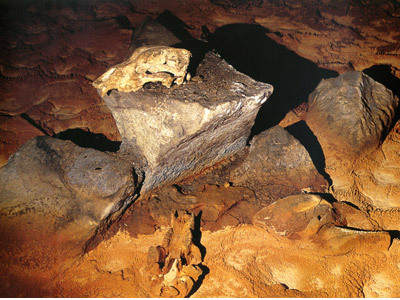 With only o short shot and 1 sentence the Bear Skull Altar was mentioned in the film. – and then back to religious music…. The scientists were all christians and to even talk about shamanism for them means risking their carrier and their reputation…..
Today in the 7 of Coins I am seeing a person that although lived 30 000 years ago, has much the same worldview as I do…. that is enigmatic. although back then people did not paint with a paint Brush like in the card image, he looks at me and I see eye to eye with him on many levels…. What would he think about my life here today? So: How was my day after drawing this card? 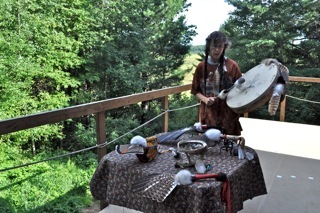 A client of mine asked me to present a shamanic teaching circle about love using the Medicine Wheel as a paradigm – for her grandchildren. So I sequestered myself for a while into my Spirit Cave and planed that event. 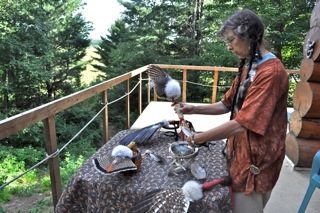 It will happen on Thursday at a Medicine Wheel I build with the family last year. I will need a lot of loving patience when working with these precious young Souls. 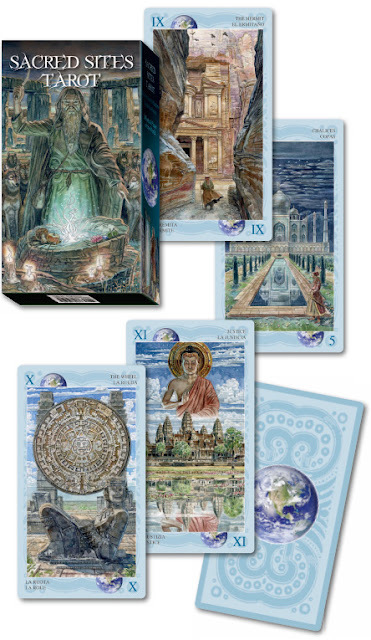 The patience that is a virtue of the 7 of coins will help me…..
… and yes, the prehistoric man in the image would understand all about love and concern for children in the circle of the family…. On more than one occasion the cards prompted me to get out old diaries and pictures and reminisce. X = Wheel of Fortune is certainly one of them. It is always quite intimidating to stand before the Reloj de Montezuma = Montezuma’s watch, as the inhabitants of Mexico City jokingly call the 24 ton colossal and envision its significance as a wheel of their worldview and sense of the cosmos, time and space. The center face is that of Tonatihu, the Aztec sun god with his tongue that doubles as a knife that slices time and flesh and lets blood and life flow freely through Nāhui Olin, the Nahuatl name for the Era of the Quaking Sun, our times right now. 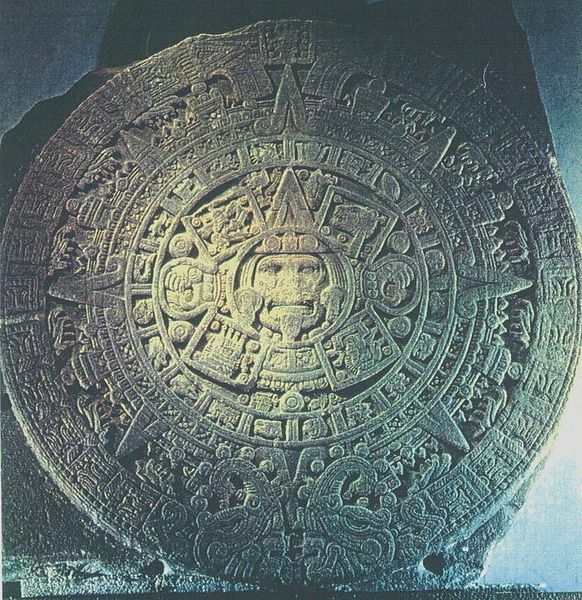 The stone also has the symbols of previous Eons, the wheels of the days of the Aztec month, the symbols of the 4 cardinal directions and the feathered Serpents that in the end devour everything, the night symbolized by Xiuhtecutly, the fiery god of the Sunset and the day itself, symbolized yet again by the Sun god Tonatihu. In the worldview of the Aztecs everyone and everything must perish and the only choice man has is, to decide when and how. Suicide and becoming a sacrifice were the most honored ways, while dying of illness and old age were frowned upon and in some traditional circles of the Mexica of today still are. This general world view was widespread in pre-contact Mesoamerica and signs and symbols of it are found in all the cultures. Of which the Aztecs were just the last and probably the best known today. 2. 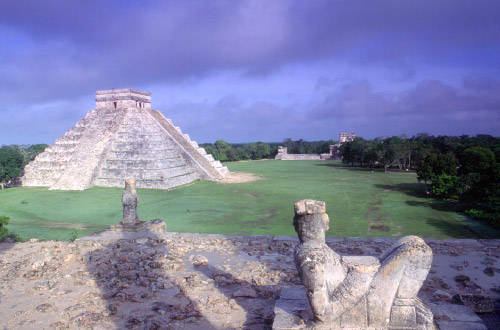 The place for a sacrifice would undoubtedly be the altar of Chac Mool in the temple complex of Chichen Itza of the earlier and unrelated Maya culture. Here in the jungle of the Yucatan peninsula the priest would place offerings including the still quivering hearts of a sacrificial victims onto the tablet on the lap of the stone Spirit in order to beseech the gods to bring rain, fertility for the crops and protection from enemies. 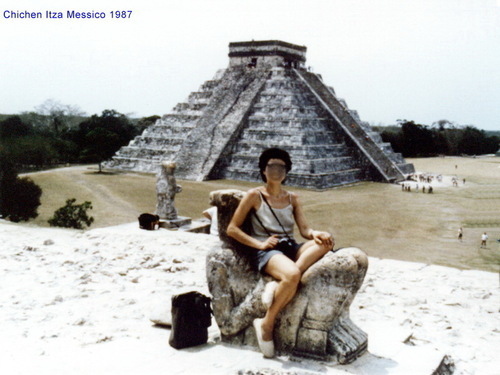 I well remember splendid Full Moon nights spent on the Pyramid of Kukulkan, (the Feathered Serpent) and looking across to the Chac Mool on top of the Temple of the Warriors watching the eery shadows dance to the sounds of the jungle like a thousand Spirits in for a visit from Forever…. Sadly nowadays the site is closed up and guarded and visits like these are a thing of the past. ………………………………………………………………………………………………………………………………………….. I am not quite sure why these 2 relicts are shown on the same card. Did the artist not know they are from different cultures? Is it just for effect? 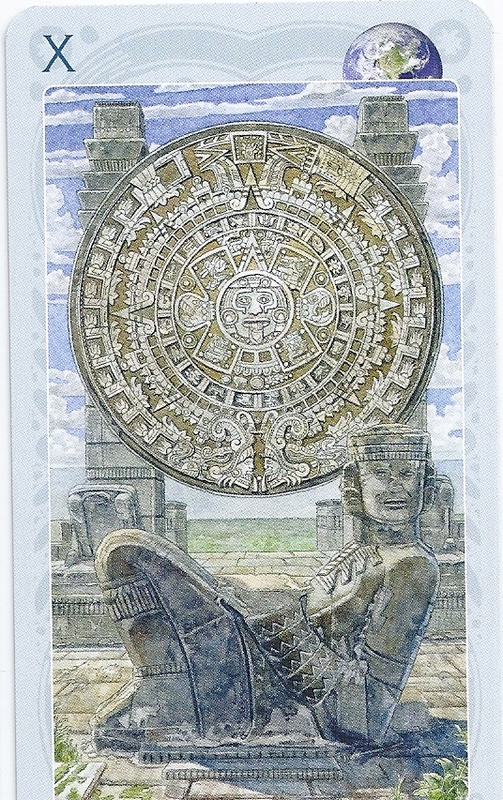 I like the Sun stone as a symbol for the Wheel of fortune. We all will be eaten by time…. 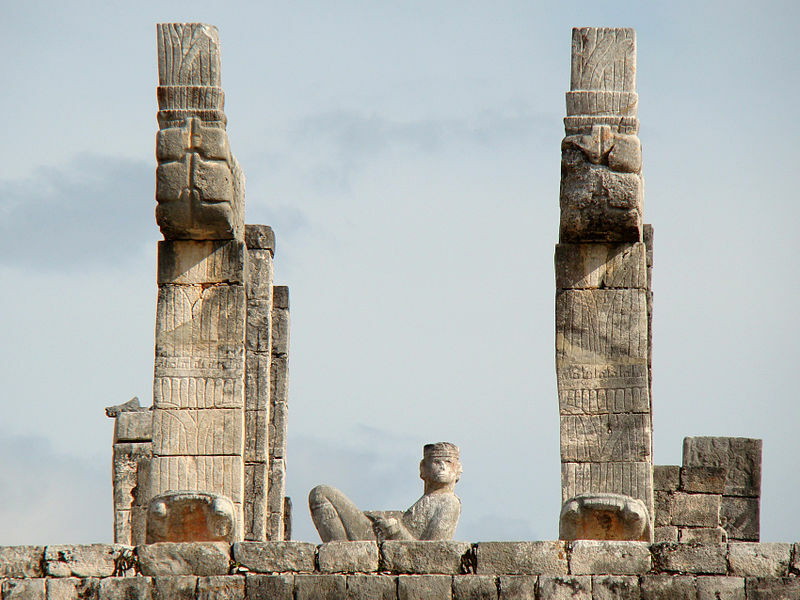 And the Chac Mool – is still waiting for a true sacrifice – like the ones of time past – and not the Bananas and Pepsi bottles today’s tourist put on top of his plate to snap a picture…. There are quite a few cards that – better than any other image – for me personally embody and enliven the concept of certain RWS meanings. Yes! It clearly shows the meaning of having to rise high above a creative project, situation and get a Bird’s eye view of the situation / the project. Only from up here we can see the whole “landscape as it now presents itself. The Condor looks with detachment down upon the creation of humans. = We are looking at it from the vantage point of a different species. We are getting the detached perspective of a Being outside of the situation. Like a counselor sees a marriage and all its problems with a more detached overview. Like I “see” through the eyes of one of my Owls and then can point out things previously unnoticed and also ways out of the labyrinth of problems….. They are labyrints, to be walked in a sacred manner. Each step each drop of sweat a gift to the Spirits. The Animal geoglyphs are just that = labyrinths. NOT maizes, where you get lost. Learn from the Monkey and his roundabout circular round and round again sooo human -like tail spinning spiral. Learn about his ways while you walk this gigantic labyrinth in the heat and dry air – or the freezing night up on the plateau – and see what you learn about the human condition. The human- like Owl Man/ Being is also often called the “astronaut figure” . Here it is drawn up the hill however – not so much labyrinth but steeeeeep climb leading – where? Straight into the head, where our ideas come from – and all our machinations and ruminations. Into the head and around – but NOT into the eyes! != towards sacred vision. Were the eye circles sacred altars once? I would check that – go there, just touch the Earth…..
Was it the Owl that was to see while soaring over the labyrinths at night? Were there offerings left for her? – For the Rodent prey of the Owl People that is? Corn and Grains that brought rodents out of their burrows? So Owl man could feed? Or were there offerings of putrid meat – of the recently dead, that were left for Condors to come from far and wide – to strip the bones bare? To take them up to their nests up high in the mountains? The Condor: Was the Condor their Messenger to the Great Mystery? Condors are highly revered all over ancient and modern South America. 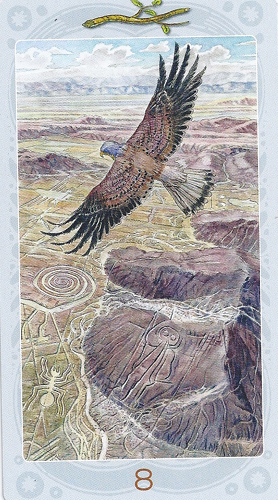 The Condor alone could see the whole picture – the whole mystery….. 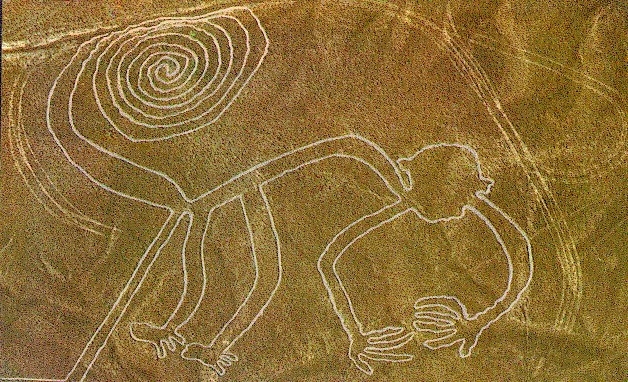 Some people said the geoglyphs are to be seen by the stars! ?? ?– At night, in the dark? The Star People might be too high up above to see it…. I am coming back to the Condor – who flies in the rising heat of the morning Sun…..
and the Owl – Messenger of the darkness of mind and shadow, through which we often stumble…..